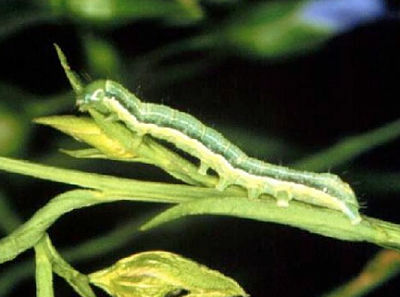 Lygus counts and bertha armyworm (shown above) counts are up this week. Saskatchewan and Manitoba growers are encouraged to scout for lygus this year. 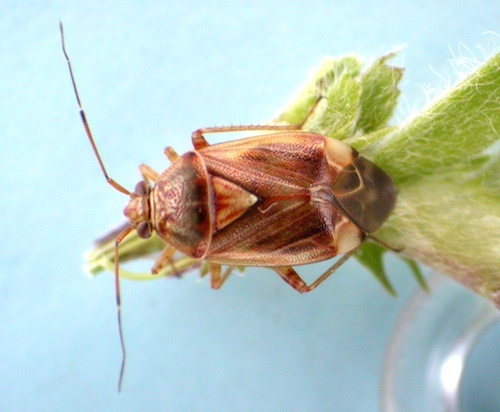 Lygus has been reported in most areas of Saskatchewan and some parts of Manitoba, as well as in Alberta where lygus tends to be a regular pest. When sweep netting for lygus (shown above), it may seem that there are more lygus in the field than end up in the sweep net. This is expected. Sweep net thresholds were establishing knowing that lygus in the sweep nets represented only a certain percentage of lygus in the canopy. Stick to the thresholds, and follow sweep net techniques outlined in this article. Why more sclerotinia stem rot this year? Moisture before and during and following flowering was the biggest factor driving up sclerotinia stem rot infection this year. Moisture as rain or high humidity or dew through the period from two weeks before flowering through early podding has increased the sclerotinia risk considerably, no matter the rotation history of the field. Most regions had these conditions this year. Fungicide use will reduce but not completely eliminate the disease when pressure is high. 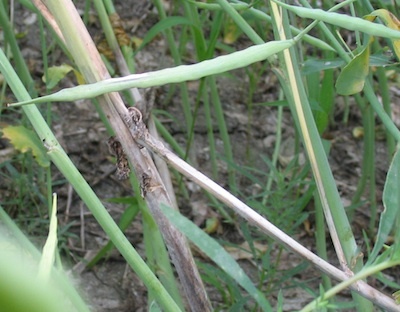 Rotation has limited benefit for sclerotinia stem rot management. 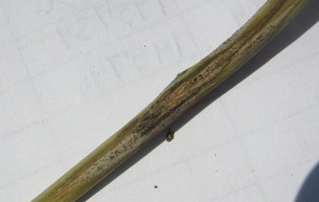 Some regions are reporting higher rates of blackleg (shown above) and most regions are seeing sclerotinia stem rot damage. Fungicide is not effective at this stage of the season, but the weeks leading up to harvest are a good time to scout. Its important to know which disease is present in order to plan rotations and varieties for next year. Blackleg lesions are greyish with black picnidia specks. 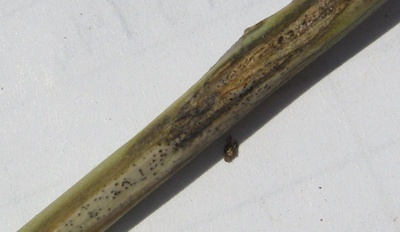 Sclerotinia stem rot will leave stems brittle, and lesions will not have black picnidia specks. In fields badly infected with sclerotinia, swath when the healthiest plants are ready. These plants will provide most of the yield. Swathing early will not preserve seeds in badly infected plants — those seeds are unlikely to mature no matter when you swath. When crops are maturing rapidly in hot conditions, swathing before 50-60% seed color change on the main stem may not give chlorophyll time to clear from immature seed. Some fields may require additional moisture — rain — in order to re-hydrate the seed so chlorophyll can clear. If growers feel they must swath at less than 50-60% seed color change on the main stem, wait until temperatures cool down in the evening and then swath at night to take advantage of those cooler temperatures and any moisture from dew.